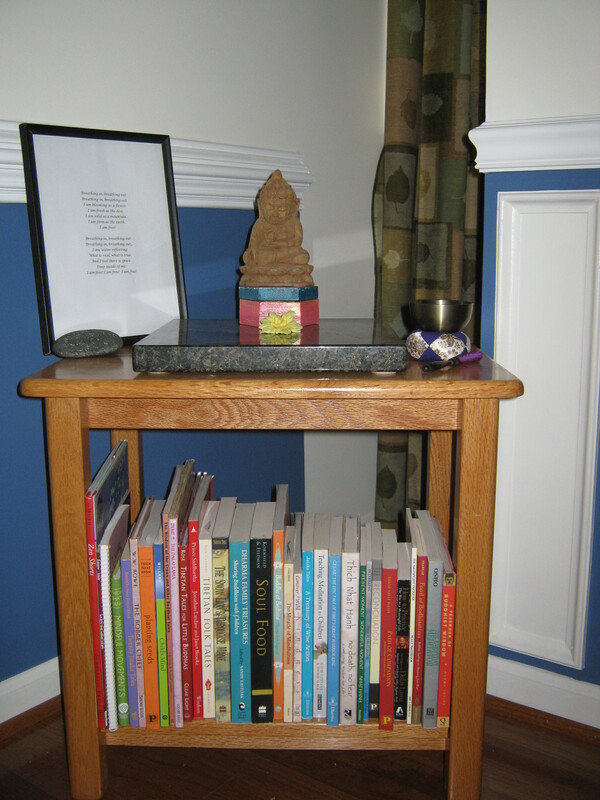 My efforts to include my children in my Buddhist practice first involved the development of a simple prayer and guided meditation practice, which is recounted in the titular story of In the Garden of Our Minds and other Buddhist stories. When my children got older, they were able to join me in short periods of sitting meditation. I am solid as a mountain. Once the Breathing Corner was established, I was ready to open up shop for morning mindfulness. My usual practice was to let my children know the night before when I would be offering mindfulness the next morning (usually twice a week). At the announced time, I would arrange the cushions on the blankets and sit, regardless of whether anyone joined me. Letting go of my expectations about who would – or should – come is a valuable practice in equanimity; making myself available to share the practice is a valuable practice in generosity. If one of my children joined me, I usually began with a very short reading or an improvised simple meditation direction, such as a way to visualize thoughts as they arise and pass or an instruction on how to follow the breath. Then I would invite the bell and we would sit in meditation for ten minutes. Some mornings were more quiet and peaceful than others; this was a valuable practice for me in patience. After ten minutes, I would invite the bell again and we would bow to the bell. Most mornings we would then share a Dharma reading for ten or fifteen minutes. I would pick a passage, prayer, chapter, or story, and each person who wanted to would read a paragraph before passing the book to the next person to read. Good passages can be found in the books listed under Resources below. Other mornings, we would sing a Dharma song from the Plum Village tradition, such as the song from our framed meditation gatha. Many of these can be found online and others are on the CD that comes with the Planting Seeds book. Once our reading or singing was over, one of the children would usually invite the closing bell. We bowed to the bell and then hugged each other. The day was ready to begin. Chanting from the Heart: Buddhist Ceremonies and Daily Practices by Thich Nhat Hanh and the Monks and Nuns of Plum Village is a wonderful book of Buddhist liturgy, with readings for everything from daily activities to special occasions as well as beautifully translated sutras and discourses. Child’s Mind: Mindfulness Practices to Help Our Children Be More Focused, Calm, and Relaxed by Christopher Willard is a great, concise, and very relevant resource for sharing meditation and mindfulness with children. 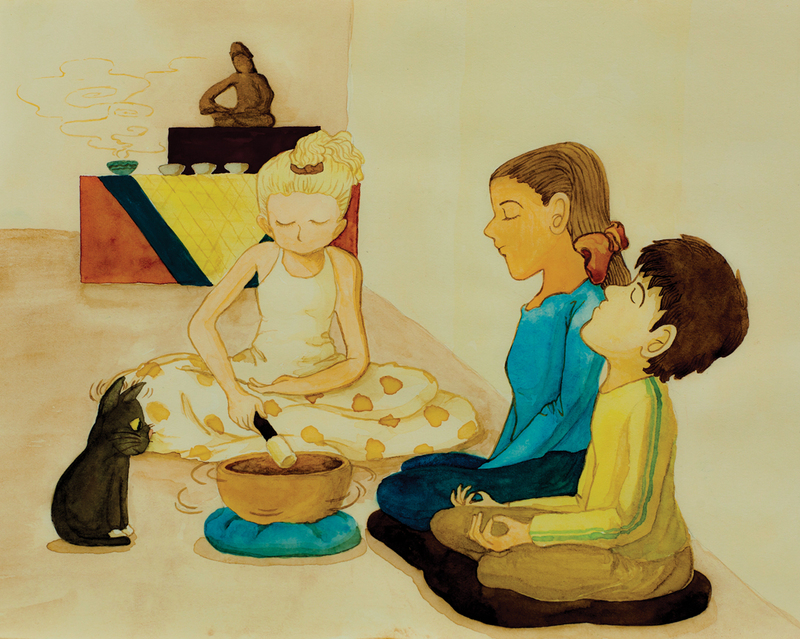 Dharma Family Treasures: Sharing Buddhism with Children by Sandy Eastoak and others is a good parent resource with essays, advice for practicing with children, and stories to be shared. It’s a bit scattered in focus, but contains inspirational and entertaining material. The Miracle of Mindfulness: An Introduction to the Practice of Meditation by Thich Nhat Hanh is a classic from which readings can be taken to share with children. Path of Compassion: Stories from the Buddha’s Life by Thich Nhat Hanh, consists of key stories of the life of the Buddha from the wonderful book Old Path, White Clouds: Walking the Footsteps of the Buddha, but in a shorter format that is more suitable for use with (late elementary/middle school-aged) children. Planting Seeds: Practicing Mindfulness with Children by Thich Nhat Hanh and others is a wonderful resource for parents and Dharma teachers with valuable examples, stories, and advice for sharing mindfulness and meditation practices with children, in particular the practices used in the Plum Village tradition. The accompanying CD contains wonderful guided meditations and songs. If you are practicing with a group of children, this is an invaluable book, and parents sharing mindfulness with just their own children will benefit as well. Teaching Meditation to Children: A Practical Guide to the Use and Benefits of Meditation Techniques by David Fontana is a fairly secular approach to meditation that gives more techniques and examples to help parents and educators.